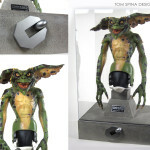 Our restoration of an animatronic Gremlins Daffy mogwai puppet from Gremlins 2, The New Batch. 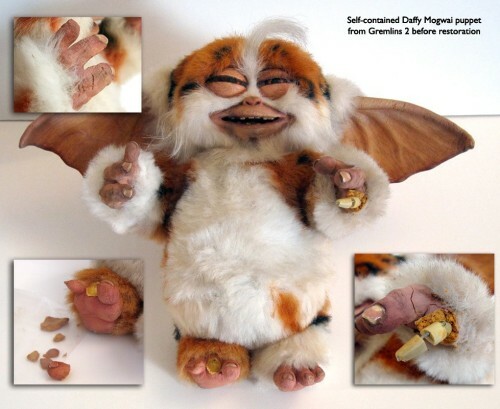 Our latest movie prop restoration is this wonderful puppet of everyone’s favorite crazy mogwai, Daffy. 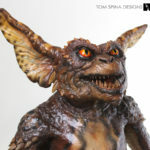 As with many of the movie prop Gremlins puppets that have been auctioned off over the years, this Gremlins Daffy mogwai puppet showed signs of damage to his foam latex skin in many of the more used areas like his fingers, toes, and mouth. The production damage combined with the simple age and natural deterioration of the foam latex material for some minor damage that needed restoring. Luckily, the puppet’s toe and even the small pieces of finger were saved for use in our restoration of the movie prop. Whenever we are able to save original pieces and reassemble the missing areas we try to do so. This way we can can keep the props composed of as much original material as possible. Once the fingers and toes were rebuilt, we patched and the paint touched up his face and hand cracks. We also gently opened his eyes to give Daffy more of his signature, wild-eyed look. 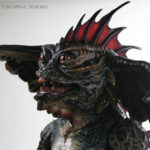 If you’re a collector in need of movie prop restoration for foam latex masks, puppets or even costumes and creatures, we’re the trusted source for that type of work. Our team is experienced and focused, with the skill of an FX shop and the care of a museum conservator. 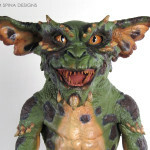 Click here to check out several of our other Gremlin prop and puppet restorations!